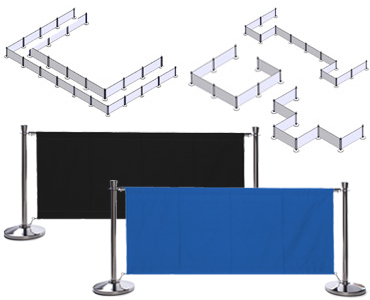 Looking for a great crowd control solution that clearly separates different areas? These sidewalk cafe barriers consist of stainless steel stanchions with large polyester banners for creating highly visible barricades. Each post has a stable weighted base and a 4-way adapter on top for connecting to other poles. This allows the sidewalk cafe barriers, also called café fencing, to be placed in a number of layouts for meeting any business’s need. In addition, the kits’ can be used both indoors and outdoors with their durable fabrication. These sidewalk cafe barriers are also available with custom printing for advertising logos and promotional messaging. What makes this café fencing ideal for restaurants and events? Sidewalk cafe barriers are ideal for bars, bistros and other eateries where they can clearly separate dining areas from the street. What makes them different from other crowd control fixtures is their ability to act as a windbreak for eating in comfort. Outdoor banner systems is their ability to act as a privacy screens, increasing the appeal of sitting outside. While the posts measure 39” tall and the banners reach a height a few inches below, they can block sight from the street and neighboring buildings. The cafe barriers can also separate reserved seating tables from the ones for walk-in customers. The modular design of the kits allows for creating sections within enclosures by setting up additional walls. Sidewalk banners is great for any business because with all the color options we offer. These are available in the shades of white, red, blue and black for matching or contrasting any establishment’s palette. 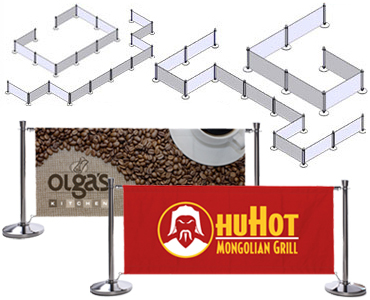 Restaurant barriers are also an excellent solution for advertising with their large display size. Custom sidewalk banners in black, white, red, and blue with 1- or 2- color imprinting with a heat transfer process. This style is excellent for creating vector graphics like company logos and promotional messaging on one side of the polyester fabric. Another option is an outdoor banner system with digital imprinting that can create full color designs like photorealistic images and complex artwork. For example, a restaurant could feature a high quality picture of their best-selling meal to draw in patrons. This type of custom cafe barrier is available with printing on either one side or both for extra exposure. With our durable outdoor banner systems for crowd control, users can build different layouts for accommodating a number of needs. Restaurants can separate their dining areas from the street with a large U or L shape while advertising their logo or menu. Event venues can form large boxes for stages and gatherings of people. The barrier sets can also be broken up into multiple shapes for even more configurations. These indoor/outdoor kits can form any outline as long as it’s made up of 90® angles. 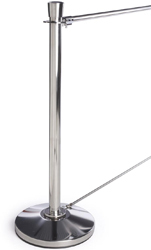 Buy on StanchionsDirect.com today for fast shipping and wholesale pricing. Visit our sister site: SidewalkSigns2go.com for outdoor sidewalk signs. 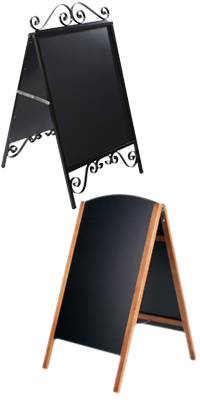 We offer Chalk and Marker Boards, Letter Boards, A-Frame Signs, Fillable Base Models, and many more styles. Custom printing is available on many different styles of signs!